It’s been a real pleasure, a profoundly moving experience, and great fun meeting and hanging out with Nigel Brennan at the UBUD Writers and Readers Festival in Bali and, more recently, in Bangkok. 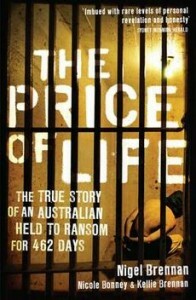 Nigel is The Dirty Hostage, an Australian photojournalist who traveled to Somalia in 2008 and was kidnapped. In August 2008 Bundaberg photojournalist Nigel Brennan travels to Somalia, along with Canadian reporter Amanda Lindhout. What happens next could happen to anyone. You have a brother with a taste for adventure, who you haven’t heard from in a while. You get a phone call on a Sunday morning from a journalist telling you he’s been kidnapped and held hostage for money – a lot of money. After official government negotiations grind to a halt, Nigel’s family – his sister, Nicky, and sister-in-law, Kellie – take matters into their own hands. With Nigel’s life at stake, the family navigates uncharted territory, doing anything and everything to bring him home. Nicky becomes an expert negotiator and Kellie effectively an international money launderer. Meanwhile, Nigel and Amanda survive separation, isolation, relocation and brutality. The fight to free Nigel takes its toll on all of them in different ways – loss of income, putting their own family lives on hold – but they discover what tough stuff they are really made of. In the end, they could answer the question we all hope we never have to ask: What price do you put on a family member’s life? And Nigel knows the real value of freedom, and the true meaning of family. Nigel happened to sit next to me at one of the UBUD festival dinners and told his story to a table full of other seasoned writers. It turned out to be an incredible evening, as his tale is neither tall nor macho but simply huge and very human. I’ve rarely met anyone so full of life, positive energy and, most remarkably, so much humanity – appreciation for the suffering and loss that others around him feel and an extreme sensitivity towards other people’s distress. Having spent 462 days in captivity, at the very edge of life and death, will surely change a person at the most profound emotional molecular level. It can make that person bitter, withdrawn, dysfunctional, pessimistic and quite mad. It may also give that person a different, very sensitive appreciation for life’s energy and this is what has happened to Nigel. His inner ambiance is extremely infectious and I consider the time we spent together the best of times, full of stories and story-telling, of very much living in the present but also of cruising, at leisure, into a brighter future. Read The Price of Life.